Home Trees and shrubs New South Wales and Queensland African Oil Palm Australian Fan Palm Bauhinia Coast Banksia Black Bean Curtain Fig Flamboyant Flame Of The Forrest Jacaranda Queensland Bottle Tree Queensland Kauri Rainforest tree Rattan Palm Red Cedar Saw Banksia Unknown tree October is the flowering time of the Jacarandas (Jacaranda mimosifolia). Originally it grows in Brazil and this is where it's strange name comes from. But for it's beauty it was introduced to Africa and pretty much any country with a suitable climate. 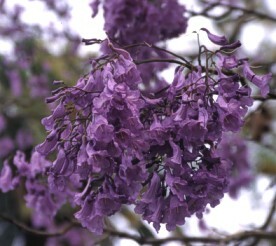 And that includes Australia, where the town of Grafton celebrates a jacaranda festival for them each year.